We’ve had t-shirts available on our CafePress store for a while now, but we decided it was time to do it ourselves. 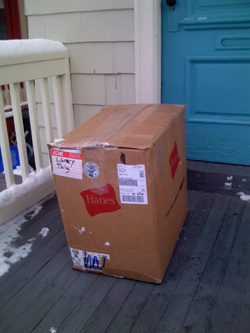 Our stock came in this morning, in several huge boxes on my snowy doorstep, and we’ll be sending out the first shirts this afternoon (some people had pre-ordered). We’ve got them in black and cardinal (a dark red-ish color), in unisex sizes S-XL. You can order t-shirts here, they cost $20 each (plus S&H). Lindsey and I immediately picked one each and ran them through the wash so we could report on shrinkage—for what it’s worth, I’d say they shrink a little bit (they’re “preshrunk cotton”, but still), and that the medium is probably a little smaller then a typical men’s medium. 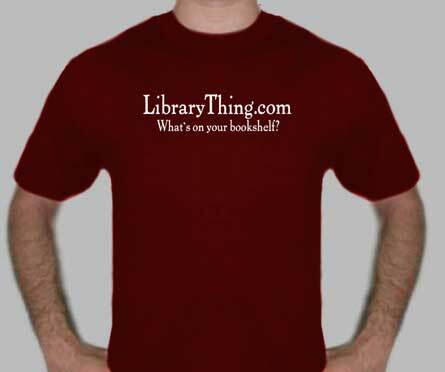 LibraryThing memberships also make great gifts (or what about a CueCat stocking stuffer? ).